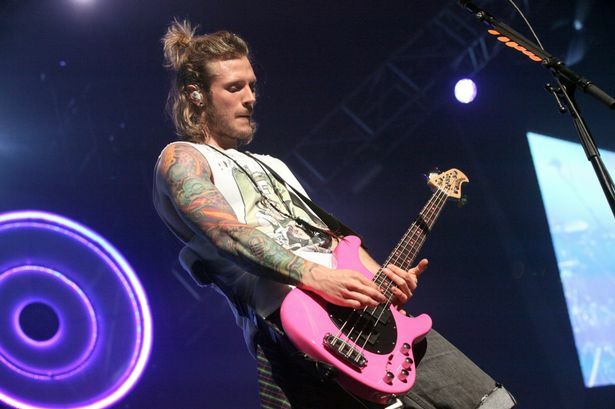 McBusted are, according to the PR displayed upon the Metro Radio arena site, the “ultimate super group” and consist of the merging of both Busted and McFly. Both bands have had a clear amount of success on their own but when forces are combined it leads to a nationwide arena tour in which tickets sell out in 300 seconds flat. My girlfriend has been screaming about this gig for weeks – she’s got McFly lyrics tattooed on her back – and she’s also a little bit cranky that I’ve just walked in for free! Support tonight comes from three up and coming acts, up and coming because I’ve never heard of them before, which is a real shame as they all possess some serious talent – serious enough for me to give a considerable word count appearance to them all in my write up. Young Brando has a sound not unlike a young Pearl Jam meeting Elbow – a combination few will understand – but which nobody should ignore. E of E (featuring a Newcastle native on drums) take to the stage performing Nirvana’s “Smell’s Like Teen Spirit” quickly combined with the lyrics of Michael Jackson’s “Dirty Diana” and the track works exceptionally well. While E of E have a logo resembling Van Halen and a sound not unlike them either its “perfect crossover rock” is followed – well, perfectly – by 3 Dudes. This band is comprised of three young men who look like they’re probably not even young enough to drink their first beer here, never mind their native South Carolina. The crowd is getting fairly anxious and the band is unfavorably jeered by most of the young women in attendance tonight as they work their way through a cover of Blur’s “Song 2”. Their set – which goes in much too fast for my liking – finishes with an absolutely blinding performance of Sweet’s 1973 anthem “Ballroom Blitz” – it’s Life On Mars all over again as I look to be the sole person in this arena who gets the joke. There’s a lot of gimmickry and tongue in cheek antics tonight, one of the band members mentions that both Cheryl Cole and Ant & Dec are in attendance, but neither can be confirmed – and it’s clear that by the time a full sized UFO helps the band land “in the round” to play a short portion of the set towards the back end of the arena we’re seeing probably the most well oiled production touring in the UK at the moment. References to Tom Fletcher’s wedding speech – a video which nicely cued up “Crash the Wedding” as one band member wore a wedding dress onstage – and Russell Crowe seemed to be taken well by the band. They poked fun at each other and attacked their own opinions but the realization was that these men are, whether you like it or not, rich beyond their wildest dreams and don’t mind taking the piss out of themselves in the name of revenue. As I left the arena that night I felt a strange sense of entertainment – “All About You” and “Year 3000” are great Pop songs, even if I abhor the genre, and while it might not be my own personal taste – you can’t deny the skill of these five men to give those in attendance one of the best performances of their lives. And then repeat that process almost 35 times over for the rest of the dates.